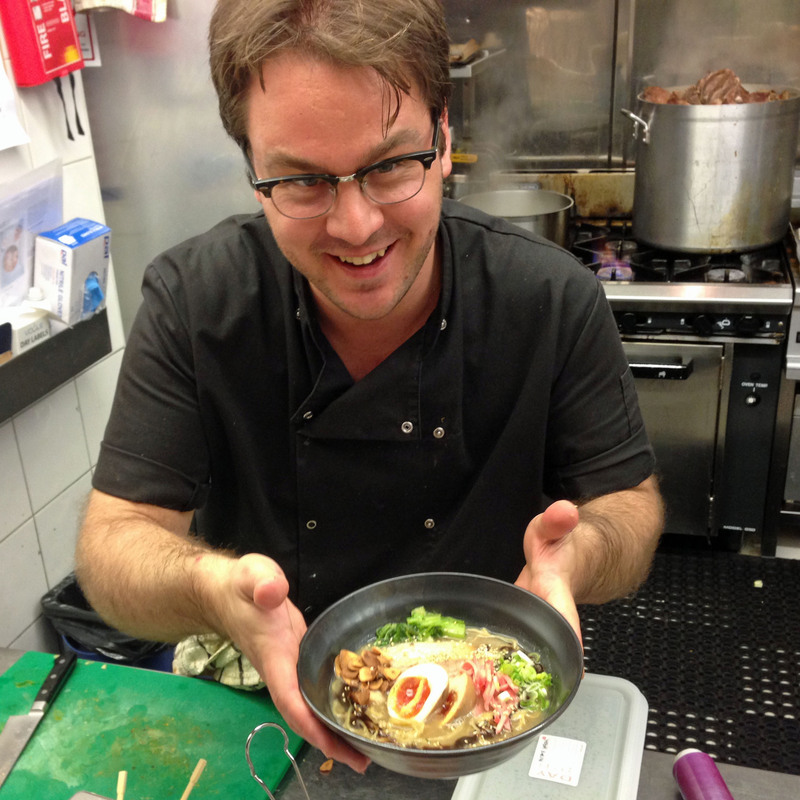 This month the 2011 the Masterchef winner Tim Anderson is visiting Brixton and so your intrepid reviewers sneaked in (incognito as usual) to provide a review to urge … yes we say urge (which is about as strong as it gets) to make a booking. And try, if you can, to go with a party of at least four, for reasons that will become clear. 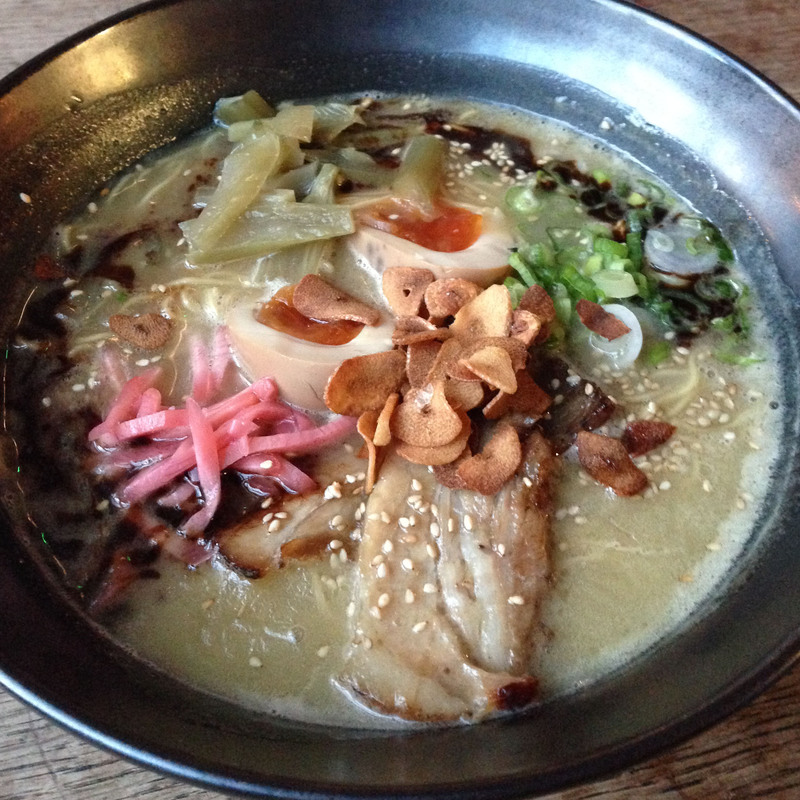 The restaurant for the month is now called Nanban – southern Japanese cooking. But first about Market House. This is just a canvas with a large room, various wooden tables, space outside and noise just on the edge of providing a sore throat the next day. You are greeted by the most divine waiter (his description not ours) who shows you to your table and keeps you entertained throughout the meal. The food comes in three parts, small plates, big plates and one dessert. Small plates were great for sharing and on our visit they had: karaaga – deep fried garlic chicken thighs (four in a box and our favourite our of the lot), ackee and saltfish karrokke (an homage to Brixton and a sort of deep fried croquette), sweet potato (another homage), buttered spring onion (fried on a stick) ….well no use telling you what you can choose from as it changes, so let it be a surprise. Luckily we were a foursome so could try them all. The big plates are the ramen with the brown stew ramen as the signature dish. 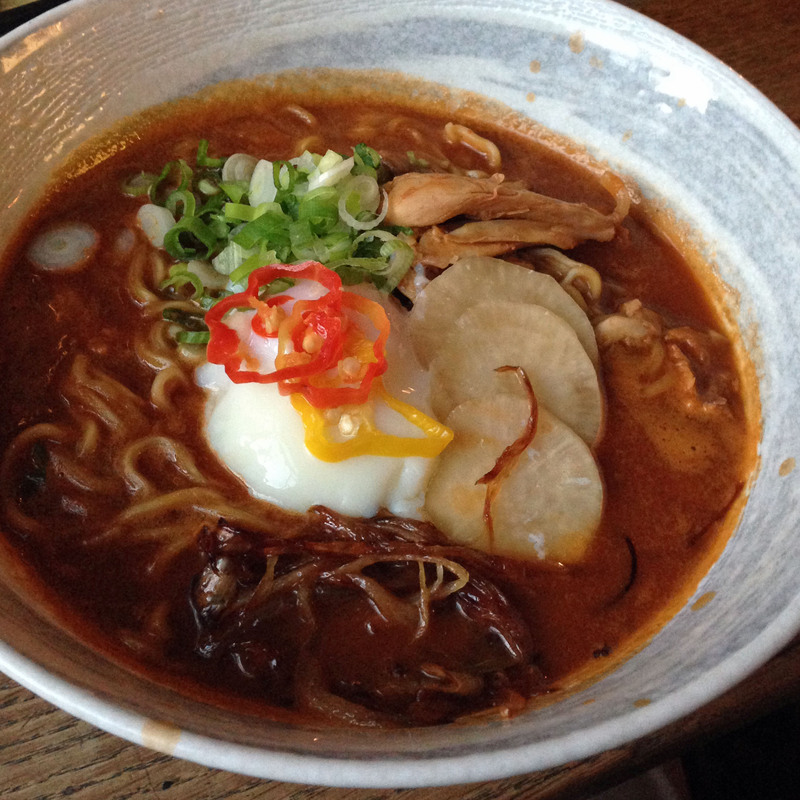 This is thick noodles in a “tomato-tamari-stout broth”, with scotch bonnet peppers, chicken and slow cooked egg. Sounds like a dog’s breakfast but really a pretty picture and tasted hot, spicy and tangy. Much like you would expect given the broth. As with the small plates, there were four of us and four main dishes, so we were able to taste them all. Next is the Kumamoto ramen with noodles, pork belly, tea-pickled eggs and lots of garlic (fried chips and oil) as well as pickled mustard greens. Kumamoto ramen is a variation of tonkotsu ramen which is supposed to have a soup made with chicken stock as well as pork bones which makes the soup milder and a little bit lighter. But we were definitely not experts so who’s to know. It was a pleasure to eat – my hyperbole store is now running very low and there are still two to go. 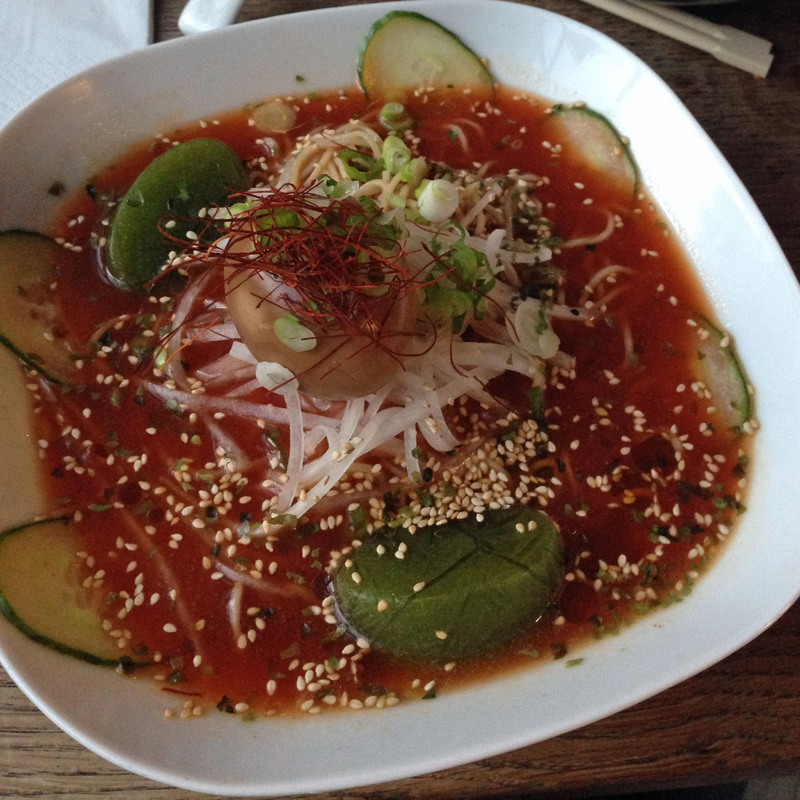 Yuzu-Chili ramen is the veggie option with the yuzu-gochujang-shitake broth with tea-pickled egg, sesame oil and cucumber ice cubes – just delicious. So already having been to three cities – Fukuoka, Kagoshima and Nagasaki. 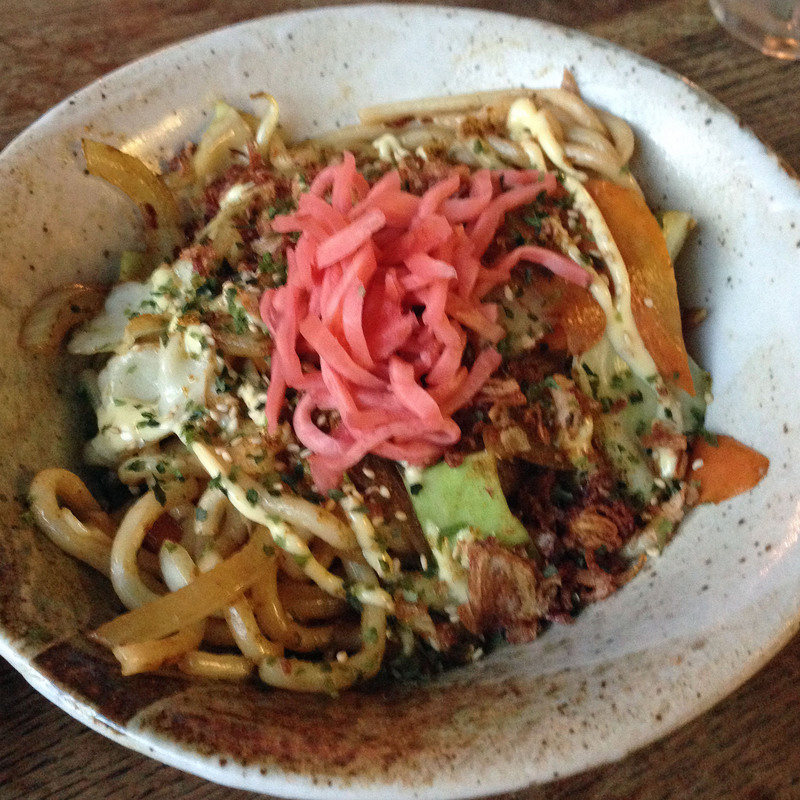 We now moved to the Curry Yaki-Udon which is ubiquitous – contains various vegetables in a sweet curry soup topped with pickled ginger, crispy onions, nori flakes and Japanese mayo. Not too hot and had a sour flavour. So we haven’t been very explicit but the flavours were really distinct between dishes – just go and try. The reason for the depth of flavour can be seen in the right hand side of the picture we took at the end – the huge stock pot filled with pork bones. We had a portion of Mr Whippy melon and matcha ice cream which we didn’t need and probably after the whole meal could have had some more matcha to give it a distinctive taste. We washed it all down with a variety of drinks from the bar and the menu – the menu has Pressure Drop Nanban Kanpai which is a wheat IPA with yuzu (a citrus fruit), grapefruit and orange juice – making it sweet like a Belgium beer but with lots of acid notes. But there were four others to choose from and not all alcoholic. The only way to do justice to the photographs we took of the main dishes is to show them all full size. So here goes.